Kymeta, in partnership with Cradlepoint, Inc., TrellisWare Technologies, and CopaSAT, LLC, skillfully proved their capability of seamless communications near the southern U.S. border. 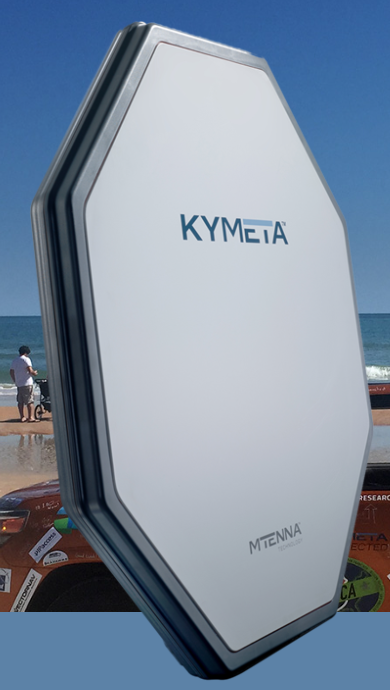 In September 2018, Kymeta conducted a series of field trials with United States federal agents to successfully demonstrate the benefits and feasibility of reliable, seamless communications along the southern border of New Mexico. This communications company was making good on the promise of global, mobile connectivity along with partner CopaSAT, and trial partners Cradlepoint, Inc. and TrellisWare Technologies. The trials revealed that Kymeta demonstrated the reliability of its network capabilities that leveraged both cellular and satellite from a moving platform. Agents used existing communications equipment as-is, with no modifications or satellite expertise required to access the network. Smart devices, laptops, unmanned aerial systems (UAS), cameras, and other communications solutions stayed connected from a moving vehicle with no disruption in service or network quality. Kymeta successfully demonstrated a complete hybrid network architecture to field agents operating in a communications degraded environment. The Kymeta terminal provided on-the-move connectivity to SES satellites which was blended with terrestrial LTE networks using a Cradlepoint software defined wide-area-network (SD-WAN) router. Access to this network was extended to agents using TrellisWare mobile ad-hoc mesh net (MANET) radios. Kymeta’s hybridization model combines satellite and cellular networks for enhanced performance and allows for dynamic traffic management between networks enabling best-cost data routing and other software defined features. Scott Tatum, Director, Complex Solutions, CopaSAT stated that traditionally, mobile satellite solutions come in the form of very small aperture terminals (VSAT) mounted on specially designed communications vehicles or deployable field kits that only provide communications when stationary and require a technician to setup and point the antenna. The technology brought by Kymeta demonstrated that reliable satellite communications can exist on virtually any mobile platform, on the move, and with little to no operator training or involvement. The architecture leveraged an SD-WAN topology to combine satellite and cellular network technologies. Using SD-WAN is critical as it enables dynamic backhaul routing using the best backhaul connections available. In a dense urban environment with modern infrastructure, LTE might be the best path. However, in remote operational areas satellite is likely best. When both solutions represent beneficial backhaul pathways, the SD-WAN is leveraged to intelligently route data and shape traffic flow. Mission critical information can be delivered via multiple pathways for redundancy, where high-bandwidth traffic, such as file sharing, could be routed to a separate connection. The SD-WAN makes the best decision on how to route data in a dynamic and changing environment so that operators can focus on the task at hand. Ben Posthuma, Senior Solutions Engineer, Kymeta added that the combination of these devices and solutions enabled secure and seamless communications from operators in a field environment to other operators and commanders distributed across the country. The system automatically and dynamically switched between cellular and satellite to find the best connection quality. The agents didn’t have to tell the system to switch, it just happened. All the users had to do was connect to the Wi-Fi in their vehicles, and the system did the rest without additional intervention. In addition, the system provides the added benefit of working with existing communications equipment. Posthuma concluded that Kymeta eliminates communications challenges in the field by providing a low-profile, mobile SATCOM solutions that can deliver mission-critical information regardless of location. The antenna works with existing communications tools exactly how they were purchased to be used and trained to be used. The hybridized solution allows for leveraging existing tools without anyone having to become a SATCOM expert.